Microphone prices fluctuate in price depending on model, time of year, promotional event and or the current state of technology. The best place to buy mics (IMO) is online at places like zzounds or amazon. Amazon is one of my favorite as you can find multiple vendors offering cheaper prices than you’d find at the local guitar center. Regardless of what new and improved mics hit the market, and trust me, there are new ones every year. What you should do is focus on small group of “go to” mics. I feel this is important because there are certain mics professionals go to regardless of what’s new on the market. These mics handle a wide range of recording needs without breaking the bank and sacrificing quality. Among this select group of mics my favorites are the following: Sennheiser MD421, Shure SM58, Shure SM57, Rode NT1/Rode N2. Now, these mics can be purchased brand new but don’t brush off the notion of buying them used. I know some of you are thinking “eh, isn’t that a health hazard?” or “that’s gross, the previous owners had their breath all over it and the mic may smell bad or have a little liquid damage”. 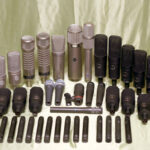 Mics by Shure and AKG are were made with really solid casings they have around in many studios and are built to last. I say if you come across a used mic like a SM57 or SM58 (just for an example) and it works and looks like it’s in good condition go for it. Those mics are hard to break and chances are if it works now it will last and be well worth the little investment you coughed up. Ebay is a really great place for buying used mics. A lot of times you can find a lot of people liquidating there studios and the mics were well taken care of and in some cases never used. I ran into a seller who’s uncle left him a recording studio. The kid didn’t want the older gear and sold 5 nueman U87 condenser mics at $200.00 each. The mics were in mint condition for the most part a couple of scratch marks on the body of a few but that was it and believe me. I purchased all 5 of those! The infamous budget mic of all time, the SM58 is the most popular go to dynamic mic in the game. 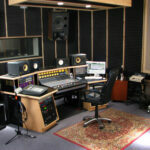 It producers a good clean sound and it works great both on stage and in a studio environment. The SM58 is known for being used for recording drum kits but to be honest it can handle any recording task: guitar, vocals, snares (and other drums), piano, flutes you name it, it records it. You can generally find this mic between $50-$80 a pop. This AKG gem a newer model of the AKG D12 and is the go to mic for micing kick drums as well as upright basses. If you can find the older D12 go for it (it’s the better of the 2) but if you can’t then go ahead and get the D112. Both mics will get the job well. The AKG D12 can be purchased for $200-$400 (just depends on where you go) and the AKG D112 for half that amount. 70% of the recording studios I’ve been in both older and modern use this mic for micing bass drums as well as tom toms. The 421 has a nice 5 position freq control switch and is generally around $300-$400 even less for the older models. When I1st got the itch to learn about recording in 1999 this was the mic I wanted. I remember it was sky/baby blue and every local studio had it in their arsenal. This mic is now discontinued but is always brought back in an anniversary package of some sort. I went to micro center and they had it brand new on their shelves for $220. What makes the NT1A great is it’s warmth and texture on vocals which competes with mics in a higher price range. Mics such as the Neumanns,not 100% of course but close enough. The newer version of this mic is the NT2-A which includes the same warmth and characteristics but with a few more features such as: Multiple polar patterns (Omni, cardioid, figure 8), High pass filter (40hz or 80hz) as well as pad (0, -5 or -10db). “The Salt Shaker” Altec 633a. This mic was prominent in the 40’s and 50’s good for vocals but works much better on kick and snare drums as well as guitars. You can find this mic for less than $100 most of the time. If you find one get one. Electro Voice 666 and yes it’s a BEAST! I’ve seen this mic kicked, dropped, thrown (that’s another story) and still work great (rock solid casing). This mic is used best for drums, bass, piano, vocals, trumpets, anything! It’s a perfect all around mic to have in the studio. The 666 can be found on eBay between $150-$200 another mic worth it’s price – True Vintage! This vintage mic gained it’s claim to fame furring the 1960’s when The Beatles Engineer Geoff Emerick used it for the Pepper’s Sessions. It’s really good for vocals (has a British sound) and runs for $200-$300. This was the go to mic for groups such as The Beatles and Artists like Jimmy Hendrix. Built like a tank and versatile to a fault, the professional quality EV RE20 has been a mainstay in studios (as well as broadcast facilities) for well over 35 years. Great on low-frequency instruments such as bass cabs and kick drum, the RE20 also excels as a tom mic and can also be used for recording electric guitar. “For that close, intimate kind of sound, the RE20 is a great vocal mic as well,” notes producer/engineer Robert Margouleff, who used the RE20 throughout Stevie Wonder’s classic Talking Book and Innervisions sessions. “Because it’s a very directional mic, Steve was able to find its axis quite easily-plus he could sing right up against the windscreen without having to worry about pops or anything.” Includes a bass roll-off switch. – a good alternative for the Electro Voice RE 20 is the RE 15, which sounds better than the RE 11 and has a wider frequency range. – do not overlook the Beyerdynamic M 201, which is a great mic for (snare)drums, guitar, horns and percussion. It is still in production after more than 30 years. The Revox M 3500 is a 201 in disguise and often much lower in price, on the 2nd hand market. thanks for taking time to read my post and leave a comment. Most of all, thanks for expanding my knowledge and giving my readers more accurate/quality options. I’ll have to check those mics out for sure. Thanks again! great list! starting a lo-fi analog studio in Nashville, and I am going to Ebay with this list! thank you! !